Violence directed towards others and violence directed towards oneself cause an immense amount of physical and psychological damage - to the harmed and the harmful person alike, to their families, and to the public at large. 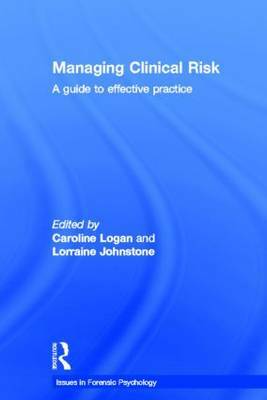 Managing clinical risk is an authoritative manual for practitioners working with harmful men, women, and young people, containing up-to-date information and guidance on what to do and how they can assess and manage clinical risk, communicate their concerns about risk, and account for their decisions about risk management to their clients and to the Courts. This book provides an evidence-based understanding of risk in key areas of practice - violence, sexual violence, firesetting, suicide, and self-harm, working with individuals and organisations alike - and among special groups: women, young people, serving and former military personnel, clients with comorbid presentations, and clients with cognitive impairment. Further, it suggests and describes the skills practitioners need to understand and communicate their concerns to all who need to know about them through coverage of interviewing and risk formulation skills. This is a guidebook to effective practice. All its contributors have a record of research, practice, and considered thinking in the area of clinical risk assessment and management. They all have a wide range of knowledge and experience about the notion of risk, conducting risk management in real world mental health, correctional, and community settings, and about working with clients with a label of high risk. Together, they combine theoretical and research knowledge with a wealth of practical skills in care and management, emphasising the collaborative and recovery-focused nature of modern risk management. Assessment and management of risk of harm is a serious undertaking, that requires informed and defensible decision-making. Clinicians who wish to access the very best of current knowledge and practice would be well advised to read this book. The topic is subject to incisive critical appraisal by internationally renowned academics and practitioners. Importantly, this book will not leave clinicians wondering what to do with the information: the directions for good practice are clear and workable. The editors are to be congratulated. Mary McMurran, Professor of Personality Disorder Research, University of Nottingham, UK. This book is an ideal complement to the recent edited Routledge text on risk assessment by Randy Otto and Kevin Douglas. Like its companion, this new, and much-needed work has excellent coherence. The editors, both of whom have highly developed connections to leading clinicians, researchers, and administrators,across the world, themselves have contributed fully a third of the content. This means that the book has an evenness and sustained depth so often lacking in ventures of this kind. Essentially, the book helps clinicians of various stripes to offer "structured clinical guidance". The book does a remarkable job of bringing together what we have learned over the past two decades or more about assessing violence and related risks and then telling readers what they need to know about constructing interventions and even institutions that will work. This is well designed book that deserves to be on the desk, not the shelf, of all serious mental health, forensic,and correctional practitioners. Well done! Chris Webster, Professor Emeritus, Psychiatry, University of Toronto; Professor Emeritus, Psychology, Simon Fraser University, Canada.